It’s that time of year again, when parents the nation over are scouring the dress up box for inspiration for Book Week characters. Or, if they’re very clever, making something special. But I have no experience whatsoever with that end of the Book Week Costume spectrum. Instead, I’ve always been a fan of cloaks, particularly for boys. With the same cloak, a boy can be Will from The Ranger’s Apprentice, Tom from The Impossible Quest, Robin Hood (green), Zorro (black), Snape (black), Frodo, Bilbo, Aragorn or [insert Lord of The Rings/Hobbit character of choice] and so on and so forth. 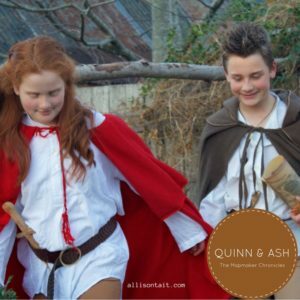 You can also be Quinn from The Mapmaker Chronicles, and to make it easy, I’ve put together a quick ‘how to’, with three levels of ‘Quinn-ness’. Last year, I received this wonderful image from Jarvis of his Quinn costume. At its most simple, the Quinn is all about brown pants, brown boots, a white shirt (level of ‘flow’ ranging anywhere from a t-shirt, to a long-sleeve t-shirt to this lovely button-up style that Jarvis is modelling), and a belt. Jarvis has added fantastic cuffs (as per the Mapmaker covers), which I love! 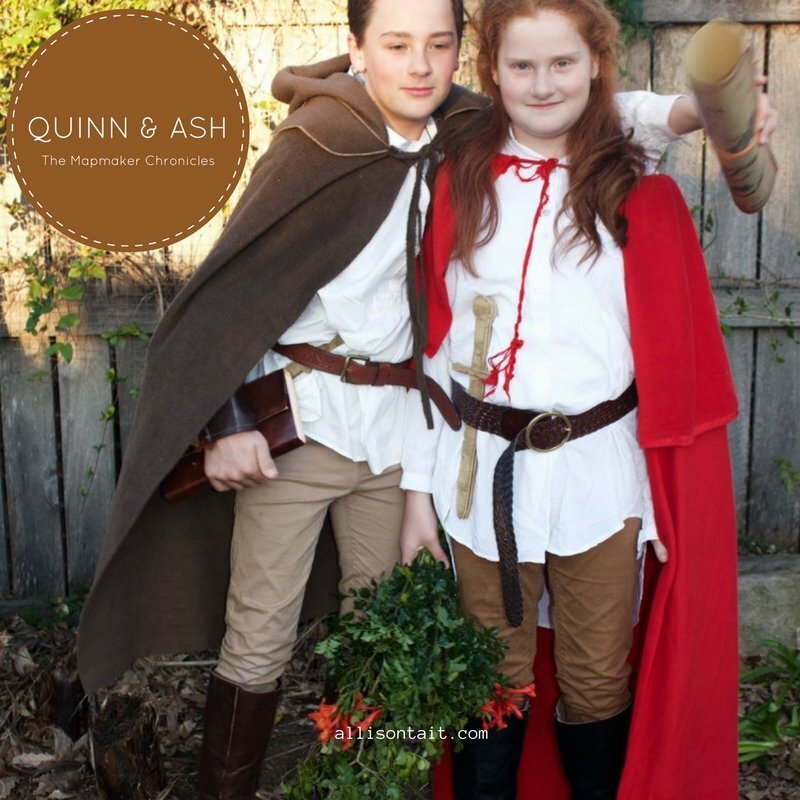 To really emphasise the Mapmaker aspect, why not use this printable, created by Kate at Picklebums, and have your Quinn create his own map of the world. Tea stains and burnt edges entirely optional. Mr12 likes to lay claim to the fact that he was the world’s first-ever Book Week Quinn and, given that he was Quinn in the August 2014 school Book Week parade, a full two months before Race To The End Of The World (book #1) even came out, he’s probably correct about that. In this image of that momentous occasion, the headless Mr12 (10 at the time), is modelling the cloak I had made for him when he was seven, and which has served us faithfully at many Book Weeks and costume parties ever since. 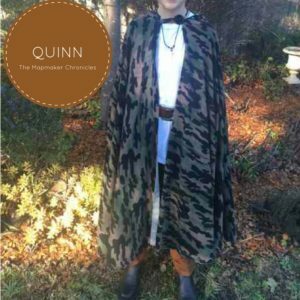 Quinn doesn’t wear camo, it’s true, but … convincing enough. Along with the cloak, you’ll note the addition here of the animal tooth necklace (integral to Quinn as the story unfolds). We bought it at a local bead shop for $5 and were thrilled all round. 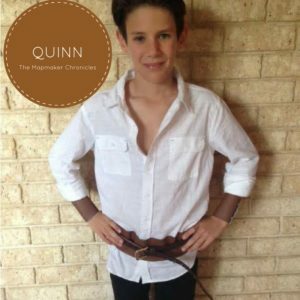 How incredibly gorgeous is my good friend Finn, all decked out as Quinn for Book Week? Finn’s mum, who is much cleverer and more stylish than I am, knows the value of a brown cloak and a few telling accessories. 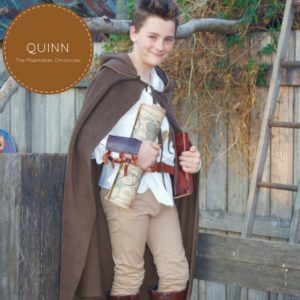 You’ll note here that Premium Quinn is holding not only his map, but the leather journal given to Quinn by Master Blau. And here’s the bonus tip of the week. Your Quinn costume works perfectly well for Ash, the stowaway aboard the Libertas, as well. 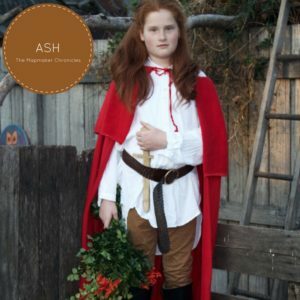 I’ve always felt it unfair that boys held the cloak advantage, but Ash helps to redress the balance. Ash simply wears the basic Quinn costume, and then add a cloak (doesn’t Lola look amazing in this red?? But any colour at all will do! ), a knife (comes in very handy but choose wooden or plastic for safety) and some greenery (she is the plant hunter of the crew after all). Too easy and just perfect for any girl who’s sick of princesses and petticoats. Updated to add: you can find ideas on how to be characters from my new series, The Ateban Cipher, here. Meet reluctant hero Gabe, rebel girls Merry, Gwyn and Midge, and dethroned prince Eddie and be inspired!